1. Start early. If possible, begin the study process at least a week before your test, or at the very least, a few days before a quiz. Studying your material at a stress-free pace over the course of a week is a far more effective way to process and learn the information than is binge-studying the night before. If you don’t know if a test is coming up, but you’re sure one is around the corner, ask your teacher. 2. Get the right study materials. Gather all your notes, worksheets, textbooks and study guides all in one spot. If your class notes are incomplete or disorganized, clean them up and get them ready before you begin the study process. Discard or put away any materials that are not relevant to your upcoming test. Ask your teacher for a study guide if he/she didn’t already provide one, or make your own (in the next step). 3. Make a study guide. If you don’t have a study guide from your teacher, make your own using your notes. Start from the beginning of the lesson or the chapter (whatever you’re being tested on) and work your way to the end, writing a list of all the material you need to cover. I’d recommend using a bulleted-list format for this task. Next to each main item, indicate any materials (text book, notes, etc.) that you’ll be studying from. The size of your study guide will depend on how much material you need to cover: you may only have a few items on your study guide for a quiz, but several pages of items if you’re preparing for a final exam. 4. Create a study schedule. This is different than your study guide. Consider how much time you have before the test and how much material you have to cover. On a piece of paper, list out the days leading up to the test, and divide the material you have to study by those days. For instance, if you have a test in five days and 3 chapters to study, study one chapter per day and leave two days for reviewing everything together. If you have 5 chapters and only 3 days, then plan to review about a chapter and a half per day, or 2.5 chapters for the first 2 days, and save the last day to review it all. 5. Study by yourself. While there are benefits to studying with a partner or a group, try to begin the study process by yourself. (If you want to team-up later, go for it.) When we study with a partner, it’s easy for us to skip over material that our partner knows better than we do, falsely thinking that because they know it, we do too. When we study by ourselves, we are forced to answer questions by ourselves, a process that reveals whether we really know the material or not. 6. Look for areas of uncertainty. You’re going to know some material better than other material, for a number of reasons. As you’re studying, be on the lookout for those times when you think, “I don’t get that,” “Why does that happen?” “What does that mean?” or other questions that indicate uncertainty. These are the areas you want to focus on. These are the questions you want to find answers to, either from your notes, text book, teacher, the Internet, wherever. When you become confused by something you’re studying, stop and figure out why. The sooner you recognize gaps in your understanding, the more time you’ll have to figure it all out. 7. Match your study technique to the material. There are so many different ways to study, and not all methods work for everyone. However, it makes sense to pick a study method that aligns with what you’re studying. For example, flashcards work terrifically for learning vocabulary words (whether in English or a foreign language), simple concepts, etc. If you’re studying for a history test or something with chronological relevance, consider making a giant timeline (on your floor!) of all the events you need to know. For studying visuals such as charts, graphs and diagrams for biology or chemistry, use a whiteboard and draw the images over and over again until you know the material. If you’re giving a presentation instead of taking a test, practice recording your presentation into a microphone (virtually every computer and smartphone has one) and play it back to yourself. If you’re studying a lot of factual material for history or a science course, try making quizzes for yourself; rephrasing the material as a question is a great way to see if you really know it! 8. Use the Pomodoro Technique. Watch my video about the Pomodoro Technique. This is one of my favorite productivity hacks because it works awesomely for accomplishing any task, but especially for studying. Here’s what you do: Set an alarm for 25 minutes. For these 25 minutes, you focus 100% on your task and nothing else. (No looking at your phone; no getting up for a snack.) When the alarm goes off, set it again for 5 minutes. For these 5 minutes, you do whatever you want: take a break. When the alarm goes off, set it for another 25-minute study session, followed by another-5 minute break. Keep doing 25-5 rotations until you’re done studying. You could experiment with different time-blocks, too. For some study sessions, you might want to work for 45 minutes, then break for 15. Whatever works for you. But the key is to stick to the timer. Truthfully, I use this technique at least once a day to get at least one task done (like writing this blog!). 9. Teach someone else the material. Albert Einstein once said: “If you can’t teach it to a six-year-old, you don’t understand it yourself.” So true, Al. So true. After studying, to see if you really know the material, try teaching it to someone unfamiliar with it. Sit some lucky individual down (Mom. Uncle Charlie. Little bro.) and try to explain what you’ve learned. If you struggle with articulating certain concepts or topics, go back and study them. 10. Review it all, and then sleep. Assuming you created a study schedule back in Step 4, you would have ideally finished studying two nights before the test. On the night before the test, take about an hour to review what you’ve been studying all week. You shouldn’t be learning any new material now, just reviewing what you’ve already covered. Plan for this review session to take place early-ish in the evening, so that you can get to bed at a reasonable hour. An extra hour of sleep will almost always be more beneficial than an extra hour of half-studying with your eyes half-closed. It might take some time and experimentation to develop a study habit or routine that really works, as all students are unique. But I hope these 10 steps help you or inspire you in some way. Let me know your thoughts, and let me know what your own strategies are: chances are high that if they helped you, they’ll help someone else. 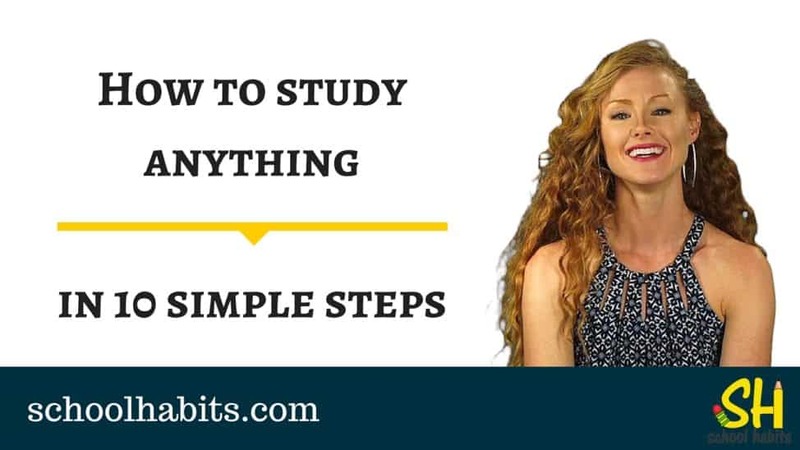 With these 10 steps, you’ll really be able to study anything!